For years, ships from other countries, laden with oil, machinery, clothes and cargo, sped past this small town (Hambanato, Sri Lanka) near India as part of the world’s brisk trade with China. Now, China is investing millions to turn this fishing hamlet into a booming new port, furthering an ambitious trading strategy in South Asia that is reshaping the region and forcing India to rethink relations with its neighbors. China’s Export-Import Bank is financing 85 percent of the cost of the $1 billion project, and China Harbour Engineering, which is part of a state-owned company, is building it. Similar arrangements have been struck for an international airport being built nearby. 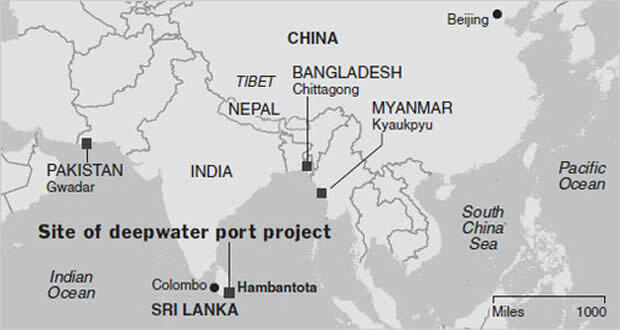 Mr. Rajapaksa has said he offered the Hambantota port project first to India, but officials there turned it down. In an interview, Jaliya Wickramasuriya, Sri Lanka’s ambassador to the United States, said the country looked for investors in America and around the world, but China offered the best terms. Still, Sri Lankan officials have refused to disclose information that would allow analysts to compare China’s proposals with those submitted by other bidders. The country has also kept private details about other projects that are being financed and built by China, including a power plant, an arts center and a special economic zone. The Sunday Times, a Sri Lankan newspaper, recently estimated that China was involved in projects totaling $6 billion — more than any other country, including India and Japan, which have historically been big donors and investors in Sri Lanka. Harsha de Silva, a prominent economist in Colombo and an adviser to the country’s main opposition party, said the Sri Lankan government appeared to prefer awarding projects to China because it did not impose “conditions for reform, transparency and competitive bidding” that would be part of contracts with countries like India and the United States or organizations like the World Bank. As trade in the region grows more lucrative, China has been developing port facilities in Pakistan, Bangladesh and Myanmar, and it is planning to build railroad lines in Nepal. These projects, analysts say, are part of a concerted effort by Chinese leaders and companies to open and expand markets for their goods and services in a part of Asia that has lagged behind the rest of the continent in trade and economic development. But these initiatives are irking India, whose government worries that China is expanding its sphere of regional influence by surrounding India with a “string of pearls” that could eventually undermine India’s pre-eminence and potentially rise to an economic and security threat. India and China, the world’s two fastest-growing economies, have a history of tense relations. But the two countries also do an increasingly booming business with each other. China recently became India’s largest trading partner, and both have worked together to advance similar positions in global trade and climate change negotiations. As recently as the 1990s, China’s and India’s trade with four South Asian nations — Sri Lanka, Bangladesh, Nepal and Pakistan — was roughly equal. But over the last decade, China has outpaced India in deepening ties. For China, these countries provide both new markets and alternative routes to the Indian Ocean, which its ships now reach through a narrow channel between Indonesia and Malaysia known as the Strait of Malacca. India, for its part, needs to improve economic ties with its neighbors to broaden its growth and to help foster peace in the region. Some of the shift in trade toward China comes from heightened tensions between India and Pakistan, which has hampered trade between the two countries. But China has also made inroads in nations that have been more friendly with India, including Sri Lanka, Bangladesh and Nepal. Moreover, protectionist sentiments have marred India’s relationships with its neighbors. South Asia has a free-trade agreement, but countries that are part of the pact get few benefits, economists say, because India and its neighbors refuse to lower tariffs on many goods and services to protect their own businesses. By contrast, the countries of Southeast Asia have minimal or no duties on most goods and services that they import from one another. Mark is a self taught private investor who operates the website Fund My Mutual Fund (http://www.fundmymutualfund.com); a daily mix of market, economic, and stock specific commentary.